In a fallout of the escape of two inmates from Central Jail by scaling the 16-ft-wall with the help of a rope here last night, the jail authorities today suspended a head warden and chargesheeted the assistant superintendent for dereliction of duty. The escape of two inmates from Central Jail has sent shock waves among the rank and file of the jail department. Soon after the escape, the jail authorities were seen passing the buck to the city police for negligence. The process of recruiting firemen has been hanging fire as civic body officials are awaiting the nod of the Mayor to fix the recruitment criteria, even though over six months have passed since the posts were advertised. With just five days to go for the district IMA elections, the doctors contesting for the seven posts have declared a “war of words” against one another. In violation of the code of conduct, the rival groups are sending derogatory messages and are organising press conferences under the veil of sharing their success stories. 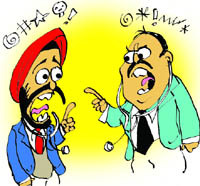 The groups headed by Dr Kulwant Singh and Dr Hardeep Singh (both contesting for the post of president) today called press meets and spewed venom against each other. 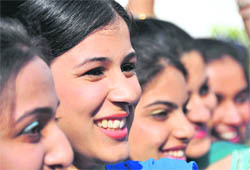 Latest data and records with college managements show that about 50 per cent of undergraduates perform miserably in English, a compulsory subject in colleges. The state government has enforced a ban on fresh recruitment of teachers, needed to teach the subject, to colleges on a permanent basis. Those who have cleared the UGC-NET examination or with a PhD degree prefer not to work in colleges due to the poor pay packages offered there. College managements have started hiring ad hoc teachers who are not well-qualified for the job, due to which the standard of higher education is falling. 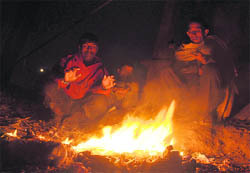 A 58-year-old widow has been braving the elements here for the past five days. She sits outside ‘her plot’ during the day and leaves in the evening. 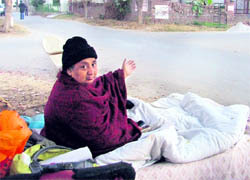 She claims that a property mafia has grabbed her 200-square-yard plot at Shaheed Bhagat Singh Nagar here. Paramjit Kaur, who lost her son last year, had been staying with her daughter in Canada. She was told there that some men belonging to the property mafia here had occupied her property. 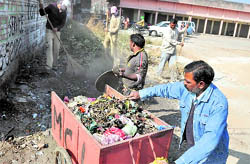 In a much-awaited relief for city residents, the ill-equipped municipal corporation (MC) started a ward-wise cleanliness drive here today. After getting directions from the state government, the civic body launched the drive from Dhaka Colony. Mandi Ahmedgarh, December 15 Accusing the management committee of private colleges functioning under the Arya Pratinidhi Sabha of allegedly violating fiscal norms laid down by the governing universities and the University Grant Commission, besides the government, activists and office-bearers of the Teachers’ Union Arya Pratinidhi Sabha Colleges Punjab and the Punjab and Chandigarh College Teachers’ Union have demanded probe into financial transactions of institutes concerned. Close on the heels of holding the first-ever auction of commercial and residential properties on November 30, which came after a gap of more than five years, and yielded Rs 9.8 crore, the Ludhiana Improvement Trust (LIT) is set to put 29 more commercial and residential properties under the hammer on December 29. Shaken up from its slumber by public outrage following the death of a man due to the absence of a manhole cover in the city recently, the municipal corporation has asked its patrol staff to give daily report on the status of manhole covers. Going by a study of the movement of different types of vehicles on the Ferozpur road for over a month, it has been found that buses are driven the most dangerously. With just three days to go for the finals of the 11th World Miss Panjaban, contestants are keeping their their fingers crossed. Damsels from Italy, the US, Canada, New Zealand, Delhi, Haryana, and all over Punjab are putting their their best foot forward to win the title. 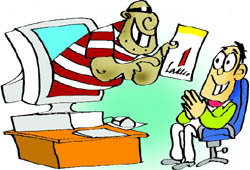 After failing to allure intended victims to claim huge amounts of money that, according to the senders of unsolicited email messages, had been lying unclaimed in accounts of deceased rich persons, tricksters have started hunting for those who give their consent to accept their share in pocketed fortune, purportedly running into billions of dollars. Though most of those who receive such mails do not respond to the offers, some do fall prey to the schemes and end up losing a few thousand rupees in the name of “processing charges” for transfer of funds to their accounts. “Work on introduction and evaluation of grape varieties suitable for agro-climatic conditions of Punjab is currently under way at Punjab Agricultural University,” said Dr SS Gosal, director of research, PAU. BCM College of Education organised a seminar on “Boosting the Communication Skills of the Teachers”. Inaugurating the seminar with his keynote address, Prof SK Sharma, director, youth welfare, Punjabi University Patiala, stressed the need for having language of cultures and nonverbal communication. Guru Nanak Public School has become the first institution in North India to introduce stereoscopic three dimensional (3D) content for its students. The content has been introduced for both junior and senior classes. School principal Mona Singh said stereoscopic 3D is a revolutionary teaching aid that gives 400 per cent more information as compared to ordinary 2D. The BSNL Employees’ Union started its series of meetings at branch level from today. These meetings are being held in connection with the forthcoming elections to elect non-executive representatives to the union in the BSNL. Taking note of violation of agreement by a private company by setting up a commercial venture along with public toilets at the Rose Garden here, the municipal corporation (MC) authorities have asked the company to shut all commercial activity on its land. Irked over the construction of road by the Ludhiana Improvement Trust (LIT) despite low temperature, a resident of Shaheed Bhagat Singh Nagar has sent a compliant regarding this to the chairman of the LIT and the Punjab State Human Rights Commission (PSHRC). Acting against violators of building bylaws, the Municipal Corporation (MC) razed three shops here today. A team of the building branch of zone D razed two shops near Rakh Bagh as these were built on public land. The proposed Khanna master plan has caused resentment among local industrialists, who fear their businesses would be severely hit if implemented. According to the proposed master plan, several areas having industrial units will fall either in mixed or residential zone. In a bid to woo urban voters before the Assembly elections of 2012, the finance and contracts committee (F&CC) of the municipal corporation is all set to pass a 322-point agenda to initiate a large number of development works in the city. A youth was run over by several vehicles after he allegedly fell from a moving bus on the Ludhiana-Malerkotla road, near Gopalur village, last evening. The Dehlon police has registered a case under Sections 304 of the IPC against the owner and staff of the unknown bus. Intensifying his campaign to get the municipal corporation Zonal Commissioner transferred, Harbhajan Singh Dang, leader of group of SAD councillors, initiated a signature campaign here today. The Marxist Communist Party of India (MCPI) has criticised the Punjab government for bus fare hike, terming it an anti-people step that would benefit only the transporters. The court of Additional Sessions Judge Mandeep Pannu has convicted five persons on the charges of killing Gurjit Kaur of Mangat village, Ludhiana. All have been sentenced to undergo rigorous life imprisonment. A fine of Rs 10,500 each was imposed on the accused. Participants from Gurdaspur gave a good account of themselves and won most of the titles which were at stake on the final day of the 56th Punjab State Schools Athletics Meet, organised by the Punjab Education Department, which concluded at Guru Nanak Stadium here today. Karatekas from the city who represented the nation in the Asian Karate Championship held in Malaysia from December 9 to 11 returned home this evening. These martial arts players performed exceedingly well and made their presence felt in the meet. Over 800 boys and girls from different countries competed in the meet.